Frederik Pohl's remarkable career in science fiction includes more than 60 years as an active writer, a period during which he acted as literary agent for many of the biggest names in the field, and a subsidiary career as editor of several different magazines, most notably Galaxy and If, as well as of the groundbreaking Star series of original anthologies. Much of Pohl's early work was written in collaboration with Cyril M. KORNBLUTH, and he subsequently wrote novels with Lester DEL REY, Thomas T. Thomas, and Jack WILLIAMSON. Pohl began selling stories in 1940, often collaborations and almost always under a pseudonym. The best of these were collected in The Early Pohl (1976), but he would produce little memorable work until the 1950s. During that decade he wrote prolifically at short length, often satirically, and produced a number of acknowledged classics, including "The Midas Plague," "Everybody's Happy But Me," "The MAN WHO ATE THE WORLD," "The Day of the Boomer Dukes," and "Nightmare with Zeppelins." His first and only solo novel during the 1950s was Slave Ship (1957), in which human exploitation of various animals as servants and soldiers has startling results. Much more important were his collaborative novels, particularly those with Kornbluth. The SPACE MERCHANTS (1953), in which advertising agencies persuade people to immigrate to the inhospitable planet Venus, was a broad satire and is considered the best of their work together, but Gladiator At-Law (1956), Search the Sky (1954), and Wolfbane (1959) are all excellent novels, particularly the first. With Jack Williamson, Pohl wrote a young adult trilogy consisting of Undersea Quest (1954), Undersea Fleet (1956), and Undersea City (1958), describing a teenager’s experiences in a future undersea city. Despite its age, the trilogy has been reprinted several times and has dated surprisingly well. Drunkard’s Walk (1960), a satire about immortality, demonstrated Pohl’s improving confidence in his own writing skills. While he would continue to write short stories, sometimes of extraordinary quality, they would come at longer intervals as he began writing novels at a steady pace. “The Abominable Earthman,” “Day Million,” and “The Schematic Man” proved that he had not lost his touch. A Plague of Pythons (1965, revised as Demon in the Skull in 1984) followed promptly. Certain people have developed the power to seize mental control of the bodies of others and occupy them for periods of time. The protagonist awakens one day to discover that he has committed a series of crimes while under the control of another mind, and that he will suffer the consequences unless he can prove what really happened. Pohl renewed his partnership with Jack Williamson in The Reefs of Space (1964), which was followed by sequels Starchild (1965) and Rogue Star (1969). An amnesiac is led to believe that he has committed heinous crimes and that he can work off his debt to society by helping to build the first successful ship to travel beyond Pluto’s orbit. He achieves this, but only after developing doubts concerning what he has been told of his own history. A new civilization arises in that distant part of the solar system, the only place free of a repressive dictatorship, which is in turn opposed by a mysterious figure known as the Starchild. The final volume involves the creation of a star that is itself a living and intelligent being. Although the trilogy is not very tightly knit and varies in tone from one volume to the next, it provides a panoramic view of a future human society that contains many highly imaginative elements. Pohl and Williamson next collaborated on a two-book sequence, The Farthest Star (1974) and its long-delayed sequel, Wall Around a Star (1983). These novels involve an interesting premise—that it might be possible to make exact duplicates of individuals, which could then be sent to perform dangerous exploratory missions. Pohl and Williamson would also later collaborate on two nonseries novels, Land’s End (1988), which describes the situation on Earth generations after a natural disaster wiped out most of the human race, and The Singers of Time (1991), which describes the conquest of Earth by an apparently benevolent alien race that administers the planet quite effectively. When one of the aliens’ most prominent citizens disappears while visiting Earth, they request the aid of humans in finding the lost celebrity. 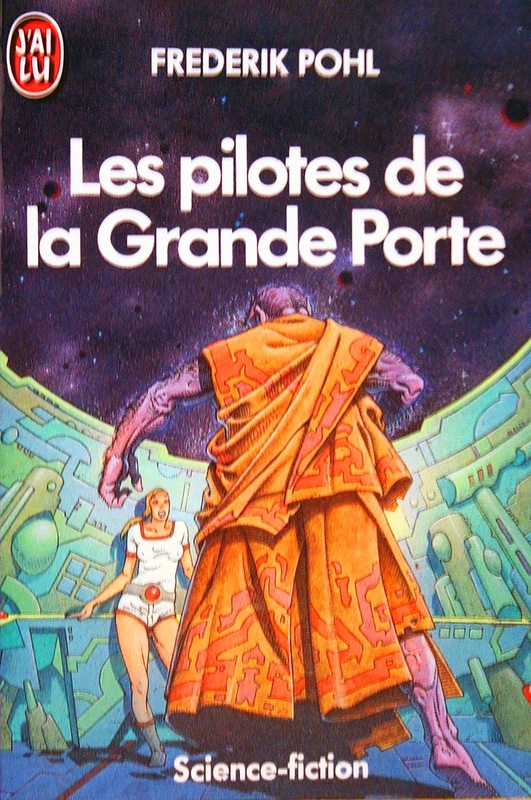 Man Plus (1976), which won the Nebula Award, was Pohl’s next major novel. In order to more effectively colonize Mars, some human immigrants are fitted with a number of artificial enhancements designed to allow them to live outside the domed colonies. The transformations have a psychological effect as well, one the planners had not anticipated. The sequel, Mars Plus (1995), written with Thomas T. Thomas, moves forward some years and describes a crisis that occurs when the computerized system that operates the delicately balanced ecologies inside the domed cities begins to malfunction. Jem (1979) demonstrated Pohl’s insights into the political process, and his impatience with its shortcomings. Overpopulation has caused the nations of Earth to consolidate into three major power structures, whose increasingly vehement rivalry spills over into interstellar space, threatening to mirror itself on a world peacefully occupied by three separate intelligent races. Pohl’s most successful novel was Gateway (1977), winner of both the Hugo and Nebula Awards and the opening volume in the popular HEECHEE SERIES. “The Gold at Starbow’s End,” which won the Hugo Award, and “In the Problem Pit” were his best short stories from the 1970s. He also won a Hugo for “The Meeting,” a posthumously published collaboration with Kornbluth. Pohl’s novels became more polished during the 1980s and reexamined some of his earlier themes, sometimes more seriously. The Cool War (1980) is still mildly satirical, but there is a bitter undertone to the portrayal of a secret international war being fought behind the scenes of a future Earth. The Years of the City (1984) shows us successive generations as New York evolves into a closed habitat whose citizens frequently engage in self-destructive activities. The Merchants’ War (1984) is a sequel to The Space Merchants; the colonists on Venus decide to rebel against the advertising agencies that control the government, and the latter respond with a new campaign. Aliens visit the Earth in Black Star Rising (1985), insisting upon meeting the president of the United States even though North America has been conquered by the Chinese. One of Pohl’s most impressive works is the short novel Outnumbering the Dead (1990). The secret of immortality has been found. Barring accidents, everyone on Earth will live forever —except for the protagonist, who has a physical condition that precludes the treatment. His reconciliation with his fate as he grows old while all of his acquaintances remain the same is touching and convincing. Mining the Oort (1992) is another variation of Pohl’s inveighing against the shortsighted policies of governments, in this case surrounding the provision of raw materials for Martian colonists. The World at the End of Time (1990), Stopping at Slowyear (1991), and The Voices of Heaven (1994) all involve problems with colonies in other star systems, and O Pioneer! (1998) adds a decidedly humorous touch to a similar theme. A trilogy consisting of The Other End of Time (1996), The Siege of Eternity (1997), and The Far Shore of Time (1999) makes up one of the strangest stories of first contact with aliens—in this case a disparate group who claim to represent two warring civilizations, both of whom seem to be lying. Pohl wrote several other novels during the 1980s and 1990s, all of them well written and covering a variety of themes. Many collections of Pohl’s short stories were published during his career; most of them contain an excellent selection of his work. The best of these are Alternating Currents (1956), Turn Left at Thursday (1961), The Abominable Earthman (1963), The Man Who Ate the World (1970), Midas World (1983), The Day the Martians Came (1988), and The Platinum Pohl (2001). Frederik Pohl’s influence in science fiction is immeasurable. As a writer and satirist, he demonstrated how the field could be used to examine current issues by exaggerating them, and he gave us a surprisingly large number of major stories and novels. As an editor, he virtually created the concept of an anthology of previously unpublished stories and edited the first such series, anticipating the Orbit anthologies by Damon KNIGHT, the Universe series by Terry Carr, and many others that have followed. He also introduced many new writers to the field and helped them to develop viable careers.